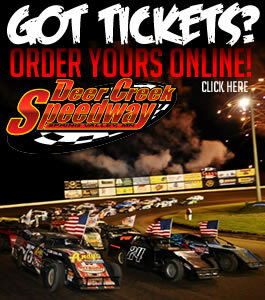 This week the school bus races and mascot night were the featured attraction at Deer Creek Speedway. Seven schools were represented in the bus races and five school mascots competed in “mascot Olympics” to determine their champion. 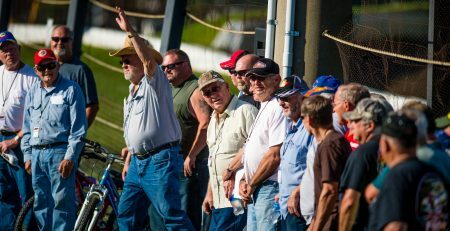 All of that and 127-cars in the five weekly divisions put on an exciting show for the huge crowd on hand. This week’s event was presented by Podien’s Power Equipment, Randy & Sandy Norby, Wagner Trucking, Adams Graphix and B&K Millright. 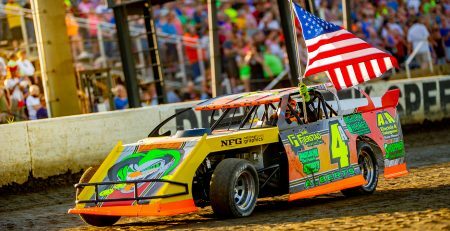 The Dirt Doctor Trucking WISSOTA Midwest Modifieds were up first for their 18-lap main event that went without a single caution. Billy Steinberg and Zach Benson brought the 24-car pack to the green flag. Benson jumped out front and took off while Josh Crary slipped past Ryan Goergen for third. Ryan Wetzstein was on the move and entered the top five and then passed Goergen for fourth on lap five. Wetzstein continued to move forward and challenged Crary for third and took the spot on lap eight. Benson had checked out and held a big lead at this point. Wetzstein then battled Steinberg for second and made the pass on lap 10. From there Benson zoomed to his first Deer Creek win and a clean sweep. Wetzstein finished second and Crary made a late move by Steinberg for third and Goergen finished fifth. The Adams Graphix WISSOTA Street Stock feature was a wild and caution filled race. Kory Adams led the pack with his dad Bernie close. A caution on lap 2 that involved three cars slowed the pace. Kory Adams led on the start while Troy Voth moved past Fred Prudoehl for third. There was a wild scramble behind the lead trio in turn four. Danny Richards hit the wall and rolled over to being out the red flag. Richards was uninjured, but was done for the race. It took three attempts to get the race restarted when the caution flag would not go away. Front runners Jason Newkirk and Braden Brauer went pitside with only Newkirk able to return. When the green came back out, Fred Prudoehl got a great start and drove to second. Bernie Adams came right back after him while Zach Elward and Blake Adams raced for fourth. Elward moved by Blake Adams and then Bernie Adams for third on lap six. Elward challenged Prudoehl for second and they made contact which also collected Blake Adams. Elward was tagged with the yellow and Adams was eliminated in the wreck. Kory Adams led the pack to the green and now it was sixth row starter Nick Schwebach on the move. Schwebach charged to third on the start while 17th starter Russell Kostreba was up to fourth. Schwebach passed Bernie Adams for second on lap 10 and then chased down the leader. Kory Adams and Schwebach has a great battle for the lead when they were door to door on lap 13. Schwebach took the lead on lap 14 but Adams remained close. Adams made a move on lap 16 and once again the race was on. A yellow came out to set up a green, white, checkered dash. On the start, Adams darted alongside Schwebach, but the yellow lights flashed on again. This time Schwebach was able to fend off Adams for the win. Kostreba’s great run ended in third with Jason Newkirk coming from the back to fourth and Voth was fifth. Jackson Hale took off from the pole for the National Fleet Graphics USRA B-Mod feature. The race was halted on lap two for a four car tangle that reset the field. On the start, Jackson’s older brother Parker stole the lead away and took off. Nick Wagner slipped past Jackson Hale for second as Brandon Maitland and Shaun Walski raced for fourth. Parker Hale would lead the rest of the way to take the clean sweep for the night. Wagner finished second with Jackson Hale third. Walski would end up fourth and Maitland was fifth. Dave Mass who has multiple WISSOTA National Titles on his resume made a rare appearance in the Brauer Roofing WISSOTA Super Stocks. It was bad news for the rest of the 15-car field. Neil Eckhart led the 20-lap race early with Jeff Brauer in second. However it was Mass that stole the show. Mass went to the top side of the track and bolted from sixth to third. A yellow for debris slowed the race on lap four. Mass quickly drove to the lead and opened up a huge lead. Mass dominated from there to score the win and a clean sweep after his heat win earlier in the night. Brauer would finish in second with Dylan Kromschroeder in third. Dexton Koch and Tommy Richards would finish fourth and fifth. Brandon Hare led the early in the Napa Auto Care Centers USRA Modified feature. Brian Albrecht sat in second but passed Hare for the lead on lap two. Cory Crapser was behind the lead duo and slipped past Hare on lap four. Jacob Bleess then challenged Hare for third and made the pass on lap five. Nate Wasmund got to fifth but got tangled up with Mark Noble to bring out the yellow as Noble went to the tail. When the green flag returned, Crapser made his move and challenged Albrecht for the lead. Crapser drove past on lap 10 and opened up the lead. Bleess then got by Albrecht for second and tried to chase down Crapser. Joe Horgfal was on the charge from 12th and got to fourth. A yellow on lap 15 closed the pack back up. Another yellow on the start delayed the race once again. Horgdal slipped past Albrecht on the start and took third. Bleess tried to get low on Crapser but just was not able to keep up with him. A big seven car melee on lap 19 would be the final stoppage of the race. Crapser led, but Bleess again would try the low side to no avail. 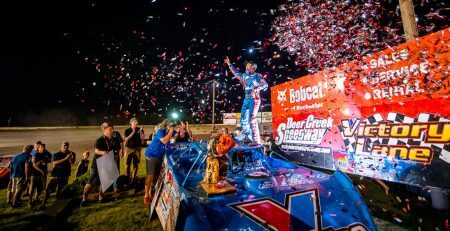 Crapser went on for his first Modified win at Deer Creek and took a clean sweep too. Bleess ran second while Horgdal was third. Wasmund ended up fourth and Keith Foss raced from 14th to fifth. 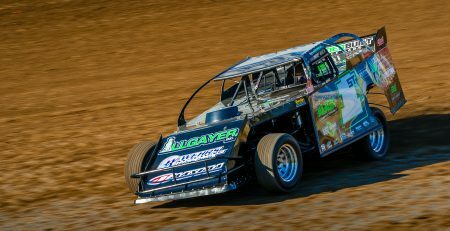 Kingsland had won the last four bus races in a row with Mike Hyland behind the wheel. They won one of the three lap dash races and Kingsland also won the best appearing bus and mascot Olympics earlier on. Seven buses took the green flag for the 10-lap event as the crowd went crazy. Doug Miner in the Blooming Prairie bus led the race, but Kingsland was coming up fast until the final lap. The Goodhue, Hayfield and Kingsland buses made contact on the frontstretch. The resulting crash had the Kingsland bus flip on its side and the Hayfield bus hard in to wall. Other bused took evasive action to the infield and launched into the air. The red flag flew and fortunately all drivers were uninjured. Blooming Prairie and Doug Miner would lead the final two lap dash to the checkered flag and the championship.